There are some great positives about Blair's Death Rain designs, but also some weird design flaws that would be easy to overcome. Firstly, is the brand called, 'Feel Alive!' The strip down the side is brilliant, but what is wrong with a bold black bar with Blair's logo and a smaller 'Feel Alive!' Although it does not appear on this flavor yet, it is likely to when they stock up on new bag designs, so you will need to refer to our other flavor reviews to see what we're on about. The flavors are color coded, which is good, but they are not necessarily the right colors for the flavors - this for example, has no relation to the pepper in question. The heatometer graphic is quite simply excellent, although the whole bag could be a heatometer. The Chips graphic at the bottom looks a little bland. These were good and crispy Kettle Chips. The crunch was maintained throughout the eating process and they stayed brittle as the munch continued toward the end. It appears that some of the Potato Slices in our test bag had been a little scared of what was to come, because they had curled up in fright as soon as the hot oil hit them. The many irregularly shaped Chips could not fight back and succumbed to a heavy weight of dark seasoning. If you don't know, a Chipotle is a smoke dried Jalapeno and is America's most popular hot pepper. To the rest of the Potato Chips eating world, that can't possibly sound like a good thing! The black shrivelled pepper even looks scary. 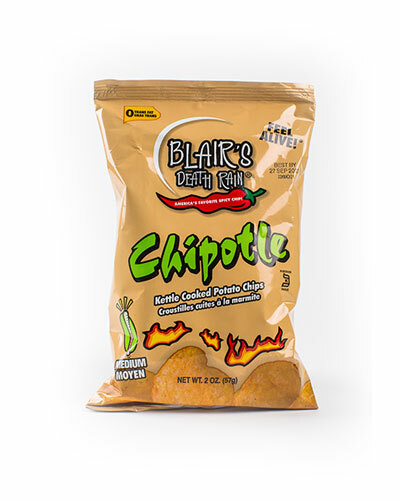 Blair's call these a medium heat Chip, but of course they laugh in the face of hot peppers, so we won't take any notice of that! As for the taste - smoky and slightly sweet, Jalapeno potato. Now this may not sound a thrill a minute flavor, but Blair's are not just all about challenges, these were most enjoyable and hot enough.